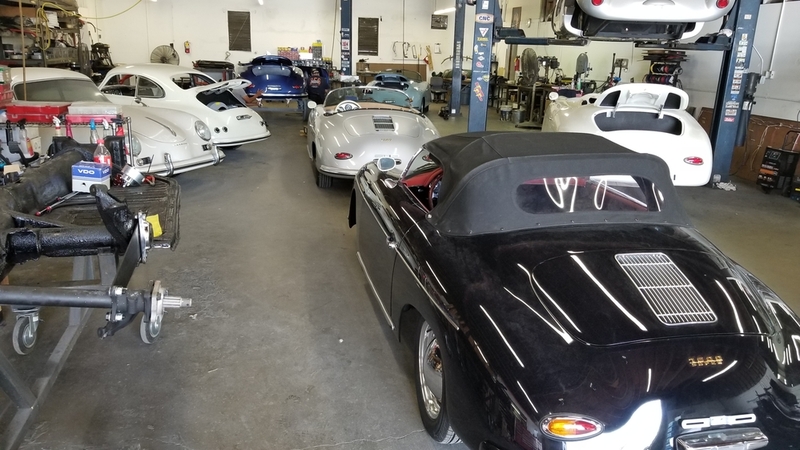 I stopped by Vintage Motorcars, Greg Leach's new shop at the old Vintage Speedsters location in Hawaiian Gardens and was totally blown away by how many cars he has in progress. Just to avoid any confusion, this is not Vintage Speedsters, it is Vintage Motorcars. Greg moved his shop to the old location of Vintage Speedsters when Vintage Speedsters was sold and moved to Arizona. They are not affiliated. Very impressive Troy, and what a surprise to see in the background of the second picture a '56 style wide-body Speedster with two air intake engine grilles on the rear lid. 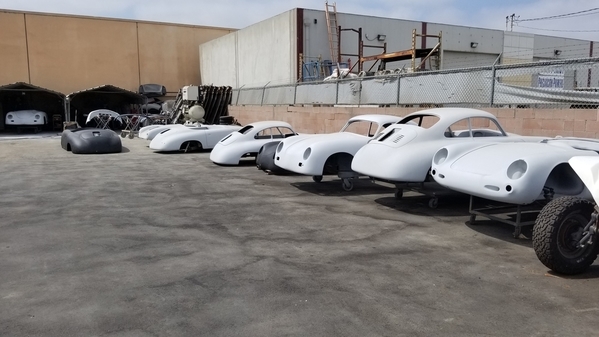 . . similar to those seen on a Spider and the 356B. Is Greg now offering that feature as an option? Yes, we talked about that one. It's very nice! It's not a Super Widebody, it's the in between version and it has a Subaru engine. Ha - all the workers at lunch? How many employees work there? Bruuuuuuce. We just met in SLO! I guess I didn't make a very big impression on you if you don't remember what I look like!!! But then, you were there for quite awhile before I got there and those free Happy Hour drinks may have had something to do with it? LOL. It wasn't me, I was there on Saturday around noon. Troy....I met you at Vintage Speedster in 2014 and again this year at SLO event. I didn't hang around for Happy Hour because I don't drink and was already brimming with ice tea ! I didn't look in Greg's office when I popped in but seeing your photos of all the cars looked the same when as when I was there the day before made me think that possibly it was you in his office at that time. Does anyone think that Bruce's car business in Hawaiian Garden's, CA is the successor to Kirk's Vintage Speedster business? I don't believe it is. Comparing the diversity of Bruce's offerings to what Kirk Produced seems to say some might. After 30 years in marketing followed by 20 more years in business brokerage I'd say that Bruce is either the luckiest or the smartest man in the room. I"d say mostly the smartest. Bruce's business that was formerly operated in another location in Southern CA was named Vintage Spyders, I believe. After Kirk's business was sold and moved 370 miles away to Phoenix , Bruce moved into Kirk's former business location in Hawaiian Gardens, CA. 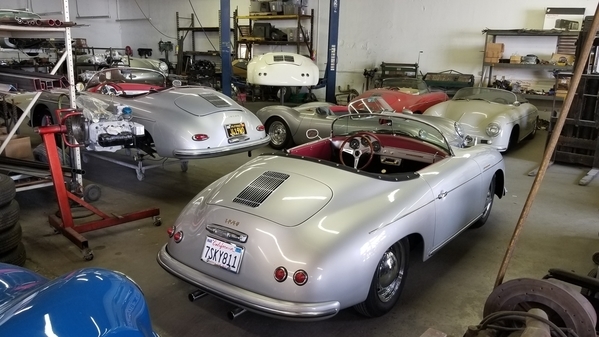 Having a Speedster business at the same address as Kirk's old Speedster business sure makes it look like the successor to Kirk's Vintage Speedster business. Both Greg and the Phoenix business changed their former trade names to whatever they are today which added to the imbroglio about who is who. Now Greg has his excellent reputation for great cars plus his creativity and ability to broaden the line to coupes and other unique offerings plus having a Speedster business located in Hawaiian in Hawaiian Gardens where over 3,500 Speedsters have been produced. Catbird seat. Jack, I believe you mean "Greg's business," as in Greg Leach. Bruce was just a visitor. I don't know - I heard Bruce was opening up his own shop and it's going to be called Very Vintage Speedsters, lol. Of course, no affiliation with Vintage Speedsters, Vintage Motorcars, Vintage Spyders, etc! I thought it was going to be "Very Vintage Bruce's Speedster Stuff". Vintage Motocarts by Bruce, LLC. I don't think either "VINTAGE" can lay claim to the over 3500 cars produced. I applaud Kirk for staying in business all those years and producing a great car at an entry-level price point enabling so many to enjoy the Speedster thing. I'd like to see Greg produce a builder id tag with the number of the car built stamped into it and applied to the vehicle. A computer inventory with original build sheet to match would be nice too. Branding a company can have a tremendous impact on its success down the road. A nice engine lid car badge would help to further his company too. He has some catching up to do as DrClock/Merklin Motors is at car 47! Lane---you are right---it's too late to edit ---maybe others will catch that as you did. Jeez---it even confused me---not a difficult task. Who's on first?? Hi Bruce. I just want to be sure you know I was just joking about the Happy Hour drinking. Also, I want to thank you for posting about the Subaru shop "Outfront" in Buena Park. It was perfect timing since we were looking for a shop to repair my son's Subaru Legacy engine after it suffered a catastrophic engine (interference) failure. Troy, you mean a "I forgot to change the timing belt" failure? Ouch, expensive lesson. I'm very happy to see Greg move into the old Hawaiian Gardens location, where he in fact started Vintage Spyders. He and Kirk shared the building for about 5 or ten years before Greg got his own shop. It's like coming home again. He's now got his crew he brought from Stanton AND hired back all Kirk's guys that the "purchaser" of Vintage Speedsters left high and dry between Christmas and New Years. To me, this is almost as bad as Steve Lawing BS, especially when the workers came back to work after the holiday and the shop was EMPTY and moved to Arizona.......along with their jobs! Troy...No offense taken. I knew you were joking. It sounds like your son had a timing belt issue. How many miles were on the car ? Is it a DOHC engine ? I have heard that the SOHC's won't bend valves if the belt goes. Outfront Motor Sports is impressive and it looks like the kind of place I wish to do business with. Carey...Thanks for answering my question about JDM Subaru engines. No wonder they are so popular in Dune Buggies ! Plenty of power and if you sand it or blow it up, just go get another one ! Crazy.....I love California ! Dual cam. Long story short. My fault for not knowing that the belt needed to be changed at around 100K miles (it was at 120K) and his fault for not checking the oil level after changing it 4,000 miles ago. It ran low on oil and one of the cam bearings froze causing the belt to jump a tooth and crunch everything. I knew he was never going to be a car guy when I took him into the garage 23 years ago at the age of 3. I started up my Porsche 911/930 replica and he covered his ears and started to cry. I guess we aren't all cut out for this car stuff. He's now a very talented, but struggling actor in the Southern California area. Hello from Southern California Aaron! ALB's favorite cheese...........wait for it...........swiss! Thank you, I'll be every day!